First edition stated on copyright and first printing with number 1 in line on copyright page. Near fine with no markings light wear in a near fine or better dj - looks bright and about new. It is the last decade of the 19th century. The Wild West has been tamed and its fierce, independent and often violent larger-than-life figures - gun-toting wanderers, trappers, prospectors, Indian fighters, cowboys, and lawmen -are now victims of their own success. They are heroes who've outlived their usefulness. "Klondicitis," a giddy mix of greed and lust for adventure, ignites a stampede. Fleeing the depths of a worldwide economic depression and driven by starry-eyed visions of vast wealth, tens of thousands rush northward. Joining this throng of greenhorns and grifters, whores and highwaymen, sourdoughs and seers are three unforgettable men. In a true-life tale that rivets from the first page, we meet Charlie Siringo, a top-hand sharp-shooting cowboy who, after futilely trying to settle down with his new bride, becomes one of the Pinkerton Detective Agency's shrewdest; George Carmack, a California-born American Marine who's adopted by an Indian tribe, raises a family with a Taglish squaw, makes the discovery that starts off the Yukon Gold Rush - and becomes fabulously rich; and Soapy Smith, a sly and inventive predator-conman who rules a vast criminal empire. As we follow this trio's lives, we're led inexorably into a perplexing mystery. A fortune in gold bars has somehow been stolen from the fortress-like Treadwell Mine in Juneau, Alaska, with no clues as to how the thieves made off with such an immensely heavy cargo. To many it appears that the crime will never be solved. But the Pinkerton Agency has a reputation for finding the answers that elude others. Charged with getting the job done is Charlie Siringo who discovers that, to run the thieves to ground, he must embark on a rugged cross-territory odyssey that will lead him across frigid waters and through a frozen wilderness. Ultimately, he'll have his quarry in his sights. But then an additional challenge will present itself. He must face down Soapy Smith and his gang of 300 cutthroats. Hanging in the balance: George Carmack's fortune in gold. 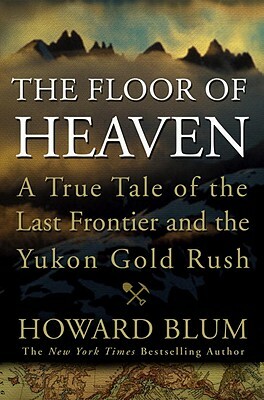 At once a compelling true-life mystery and an unforgettable portrait of a time in America's history when thousands were fired with a vision of riches so unimaginable as to be worth any price, "The Floor of Heaven" is also an exhilarating tribute to the courage and undaunted spirit of the men and women who helped shape America.